Screen time: A new study relies on brain activity during imitation to evaluate the effects of a training program. Watching movies and playing video games are almost universally beloved among adolescent boys. In the case of adolescent boys with autism, these activities — when incorporated into a training program — may help erase certain abnormalities seen in functional brain imaging scans, according to research presented Monday at the 2013 Society for Neuroscience annual meeting in San Diego. Neurofeedback training teaches individuals to control their brain waves by providing constant feedback from a computer or video screen about the nature and strength of the brain waves at any given moment. Although neurofeedback is widely touted as an alternative therapy for autism, it does not yet have a strong scientific basis. The therapy is controversial because it is expensive, its mechanism is poorly understood and many scientific studies of the treatment have serious flaws. For example, some past studies have included parent assessments of autism-related symptoms, and found that these improve with the treatment. But parents know whether their children have received neurofeedback, and their expectations may color their responses. The new study finds similar patterns: On two questionnaires of autism symptoms, the Social Responsiveness Scale and the Autism Treatment Evaluation Checklist, parents reported that their children’s autism symptoms improved after they completed the training. However, the new study is unusual in that it assessed brain activity before and after the treatment using functional magnetic resonance imaging (fMRI) scans. Neurofeedback for autism usually focuses on the mu rhythm, a pattern of electrical signals in the brain that is thought to indicate activity of the mirror neuron system. Mirror neurons fire when individuals watch others perform actions or perform these actions themselves, and some studies suggest that the mirror neuron system is disrupted in autism. Mirror neurons may dampen the mu rhythm because the rhythm normally diminishes when people move or watch others move. In people with autism, though, this dampening of the mu rhythm doesn’t occur as strongly as it does in controls. The new study tested its approach in 17 boys with autism and 11 controls, all about 11 years old. The researchers asked the participants to maintain the up-and-down oscillation of mu waves at a certain level, or threshold. If the mu waves drop below that level, the researchers stop the video games or movies. The boys received 20 to 30 hours of this training. Over time, as they became better at controlling their mu rhythms, the researchers gradually raised the threshold. “We’re basically just flexing the system,” says Datko. The researchers also scanned the participants while they did a simple imitation task. The participants watched a video or viewed still images of two fingers of a hand pressing one or two buttons, and had to press the same configuration of buttons with the same fingers themselves. 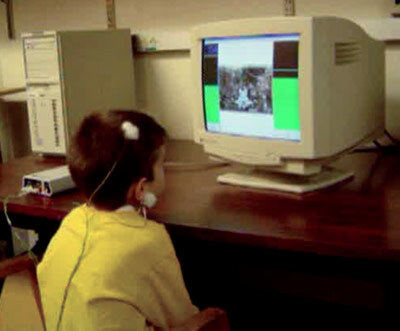 Without neurofeedback training, both groups show activity during this task in regions of the brain involved in imitation. However those with autism show less activity, specifically in an area called the inferior parietal lobule, in both hemispheres of the brain. “After training, that [difference] basically just goes away,” Datko says.